One thing I love to do is laugh. I always have a smile on my face. But the older I get the harder it gets and I'm sure SUI also known as Stress Urinary Incontinence plays a huge part. TMI, I know but let's face it SUI is a real thing and can impact you whenever you laugh, sneeze or even exercise. Well, fear no more. It's time for me to laugh again and I owe it all to Poise Impressa. Poise Impressa has changed the way I laugh and workout. I feel comfortable but most importantly confident and I love that I don't have to worry anymore. I stumbled upon Poise Impressa at Target while picking up feminine products. The display is what caught my eye. 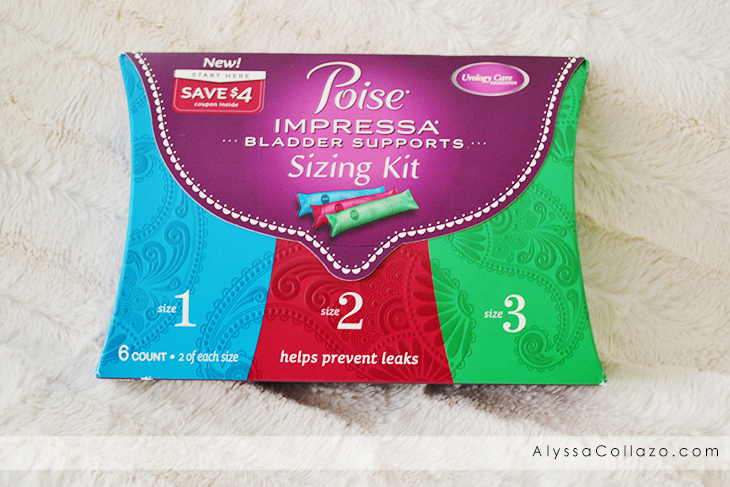 From the moment I read "helps stop bladder leaks" I just knew I had to try Poise Impressa. I started with the Poise Impressa Sizing Kit to figure out my right size. Now I'm sure you're wondering, how does Poise Impressa work? Simple. There are 4 steps. Step 1: Start with a size 1, insert the Bladder Support just like you would a tampon. Step 2: The non-absorbent Bladder Support expands to support the urethra once inside. Step 3: If you are still experiencing leaks, then progress to a size 2. Repeat until you have found your perfect fit. Step 4: To remove, pull on the string and dispose of the bladder support in the trash. Once you discover your size, you can advance and purchase a 10-count pack. With Poise Impressa, the size is not about how much you leak or how much you weigh. It's about the best internal fit for you. 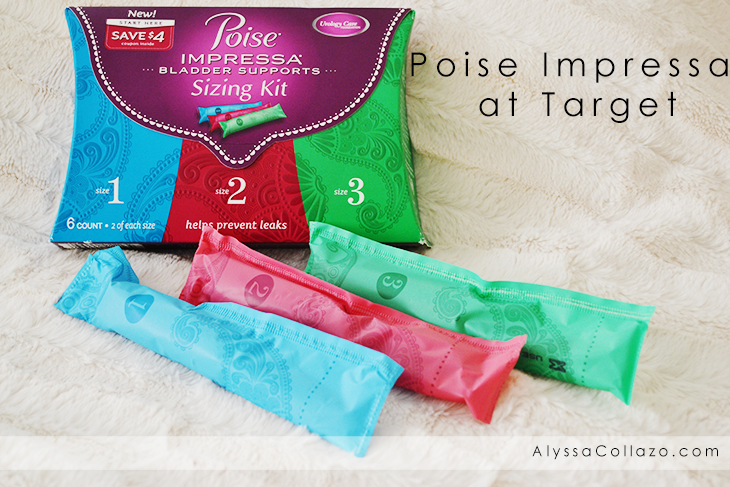 You can purchase Poise Impressa online at Target.com too. After following all the steps, I learned I was comfortable with a size 1. I was able to laugh, dance, and even sneeze again with no leaks. I love that I can wear Poise Impressa for up to 8 hours in a 24 hour period and I don't have to remove it when using the bathroom. It's so convenient and worry-free. But Poise Impressa doesn't stop there. I want to talk about their Rewards Program. All you have to do is share your love for Poise Impressa by purchasing Poise Impressa Sizing Kit at Target and then visit www.MySizePoise.com, provide a testimonial of your experience with Impressa and receive $25 promo code to Cloud9living.com. Pretty cool! I am ready to be that confident girl I once was, the one who laughed and always had a smile on her face. The one who worked out twice a week and went for frequent runs. The mom that hosted game nights and movie nights. And now thanks to Poise Impressa, I get to be that girl again, but not only that. 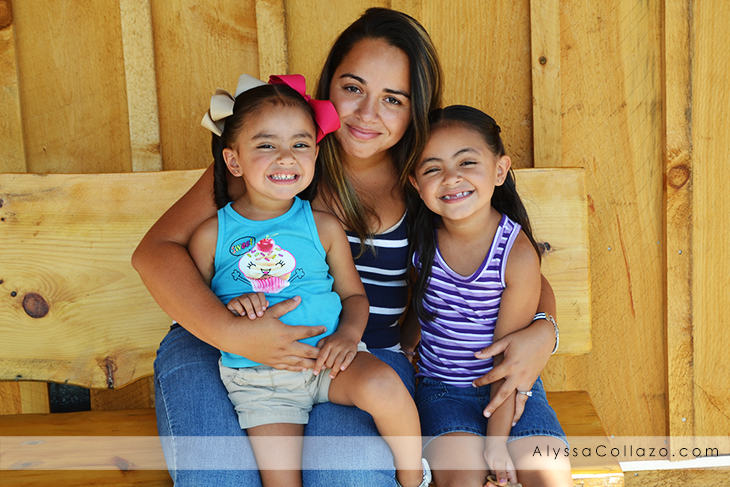 I get to be that mom again and this time worry-free. I truly don't think I could ask for more. Worrying about SUI is a thing of the past. So, not only does Poise Impressa help with SUI leaks but they also have an awesome Rewards Program. Needless to say, I love Poise Impressa and I am ready to take on the world again. Keep in mind, if you leak urine when you have a sudden need or rush to urinate, Poise Impressa Bladder Supports are NOT for you. Try Poise liners and pads for Urge Urinary Incontinence. I have a little of SUI too and hate it! I am glad there are so many options out there, helps a girl not feel alone! This is a very interesting idea. I don't have this issue yet, but after having kids, I'm sure I will at some point. I am not embarrassed to say I use Impressa. It has helped me a lot with my LBL. I don't have leakage issues, but there is a whole group of moms in my zumba class who do & there is always a collective sigh when a song with jumps comes on! This whole idea is so interesting to me. I'm glad there is help like this to keep things from leaking in the first place. Huh! Such an interesting concept. Very cool how that works :) Way better than wearing a bulky pad! It's good to know that there are now many options for those who are suffering from SUI. I will share this with my mom. I've never heard of these before. This is pretty interesting! I have a mild leakage issue but I have an undergarment for it. Thanks for this info. This is such a great innovative product that will help so many people. I love Poise! I actually just tried this product for the first time a few weeks ago. It works great! i'm really thinking about looking into this because after having two babies mama's bladder is not what it used to be!!! I don't have this issue, but a couple of my friends do. I'm sure they've seen these. My grandmother is past using these... 4 children and she's in her late 80s... but I remember she told me that she wished that things like this were available when she was younger. I love Poise products. I haven't tried this one yet but I just might pick up a box this weekend. it is great to know that there are so many products out there than can help people who have bladder issues. I heard that it happens to the best of us. I'm glad to hear there are great products for us that have this. I have to get some of these. So glad to know about this product. Now I know what to get in the future when I already have that issue. I'm so happy to hear this product is available! I could have used them when I was pregnant! LOL! It's great that a product like this is available. Thanks for sharing.